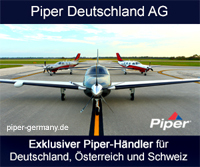 New Piper Aircraft has JUST announced that it will offer Avidyne's FlightMax Entegra Integrated Flight Deck as standard equipment on its flagship aircraft, the Piper Meridian, making Piper's deployment of the Entegra system the most extensive application of advanced glass avionics in general aviation. By adding Avidyne's state-of-the-art Entegra system in the Meridian, Piper continues its strategy of integrating advanced glass avionics throughout the model line. The Meridian joins the ranks of the PA-28 family of aircraft (the Warrior III, Archer III and Arrow) and the PA-32 family (the Saratoga II HP, the Saratoga II TC, the Piper 6X and the Piper 6XT), all of which offer Avidyne's FlightMax Entegra. "Piper is committed to bringing the latest technological improvements and innovations to our customers," said New Piper President and CEO Chuck Suma, "and the evolution of advanced glass avionics on the Meridian is a perfect example of how we've taken one of general aviation's finest aircraft and made it even better. This three-screen implementation of the FlightMax Entegra system has received strong reception from the retail market and dealers and will set pilot's expectations going forward in this class of aircraft." Said Avidyne President Dan Schwinn: "The Meridian implementation of FlightMax Entegra shows the way forward for general aviation glass cockpits. The redundancy and pilot-friendly access to such a wide range of flight management and situational awareness tools set a performance standard for small aircraft operation." In 2000, the FAA certified the Meridian, Piper's first single-engine turboprop, with a 500 SHP Pratt & Whitney PT-6A-42A turbine engine and all-glass cockpit. The Meridian revolutionized the high-end, owner-flown general aviation market by implementing air data and attitude/heading reference system (ADAHRS) in place of gyros, unique in single-engine aircraft at the time. The Meridian also introduced state-of-the-art features that continue to garner high marks from owners and pilots by providing advanced capabilities while remaining user-friendly. These features include single-lever control that optimizes aircraft performance by automatically adjusting throttle and prop action to meet pilots' requirements. As a result, pilots can easily reach altitudes above FL250 and speeds reaching 300 mph. The FlightMax Entegra system, designed and manufactured by the Avidyne Corporation of Lincoln, MA, takes the Piper Meridian to a new level of quality and sophistication. It simplifies the pilot's workload and provides the tools that deliver total situational awareness on an integrated display. The FlightMax Entegra system for the Meridian consists of three 10.4-inch diagonal, high-resolution, sunlight-readable displays, including dual redundant EXP5000 primary flight displays (PFDs) with dual integrated solid-state ADAHRS, primary engine instruments and flight director. The EX5000 PFD presents standard flight instrumentation, including an electronic attitude direction indicator (EADI), altitude, airspeed, vertical speed, coupled with an electronic horizontal situation indicator (EHSI). Cross-comparators for the PFDs constantly monitor both displays and ADAHRS and provide visual alerting in the event of any discrepancy. Each PFD is driven by its own independent ADAHRS, though a single ADAHRS may drive both displays for failover operation. A "Pilot Priority" switch also allows the pilot to prevent input from the co-pilot's PFD when a non-pilot occupies the right seat. The PFDs in the Meridian can present both standard flight instrumentation and pilot-selectable moving-map flight plan data and a RMI pointer in the primary field of view. The EX5000 multi-function display (MFD) is installed in the center of the panel in the Meridian and provides a large, full-featured moving map with optional Stormscope and the Skywatch traffic advisory service and Terrain Awareness and Warning System (TAWS) display. The MFD also comes standard with the first implementation of the EMax™ Engine Instrumentation system for a turbine engine. Primary engine instrument capability displays and monitors torque, interstage turbine temperature (ITT), fuel flow and total fuel on the PFD. A fuel totalizer is standard on the MFD, showing fuel flow, fuel used, fuel remaining, time remaining (endurance) and economy in NMPG. Options include Avidyne's exclusive MultiLink™ datalink graphical weather featuring XM WX Satellite Weather, flight tracking and two-way air-to-ground text messaging, and CMax™ Jeppesen JeppView® electronic chart display. In addition to torque and ITT, the Entegra system also displays and monitors, propeller RPM (Np), gas generator speed (Ng), oil temperature, oil pressure, outside air temperature (OAT), and electrical system performance. The system also provides data-logging capability of critical engine performance parameters, which are downloadable via the MFD data port into a standard spreadsheet format for electronic trend monitoring. "From the time the Meridian came to market," said Molly Martin Pearce, New Piper's Director of Dealer Relations & Sales, "Piper has instituted regular improvements to what is generally recognized as a terrific aircraft by increasing its gross weight capacity, enhancing the interior for more head-room and leg-room in the cockpit, upgrading the autopilot and battery systems, and redesigning the fuel systems to allow more flexible operations in cold-weather, among other product enhancements. Now, by upgrading the Meridian's avionics with the FlightMax Entegra Integrated Flight Deck, we are taking this exceptional aircraft to a new level of safety and value. The Entegra System is simple to use and intuitive while providing powerful capabilities and uncompromised functionality."